How to change your password in ARIS Connect. How to edit your profile in Collaboration. How to change your notification settings in Collaboration. How to create a subscription for event enabling. How to download objects for offline processing. How to edit objects with offline processing. How to upload offline objects manually. How to unlock offline objects. How to upload offline objects. This quick video shows how to generate reports about users, user groups, privileges, licenses, assignments, etc. This quick video shows how to create a folder in ARIS document storage. This quick video shows how open/download a document from ARIS document storage. This quick video shows how to lock a document in ARIS document storage. This quick video shows how to directly log in to ARIS document storage. 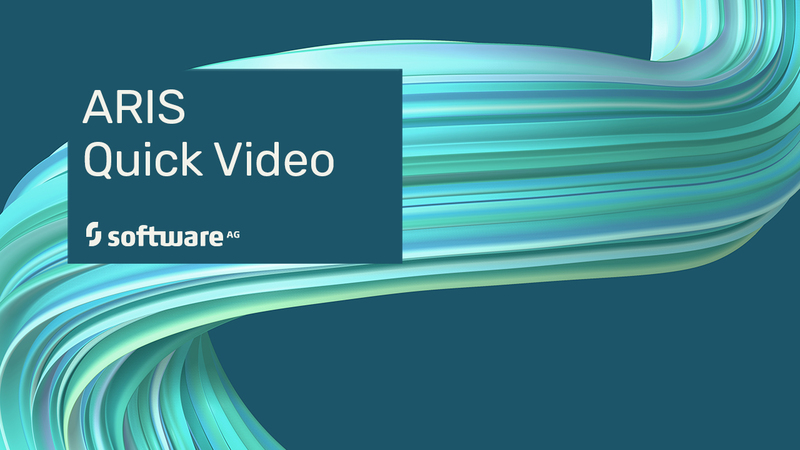 This quick video shows how to display document properties in ARIS document storage. This quick video shows how to unlock a document in ARIS document storage. This quick video shows how to upload a document to ARIS document storage. This quick video shows how to assign the relevant function and license privileges to allow usage of specific programs and functions. This quick video shows how to change your password. This quick video shows how to create a model using the &apos;Start&apos; tab of the portal&apos;s &apos;Overview&apos; area. This quick video shows how objects can be nested in the Model Editor. This quick video shows how to model and display a RACI table. This quick video shows how to change your profile: Uploade a picture or provide other users with information about your areas of activity and your interests. This quick video shows how to specify the situations in which you want to receive a notification about activities. This quick video shows how to create a new object based on an existing object. This quick video shows how to place a object symbol using the Symbols list box. This quick video shows how to place a object symbol using the mini toolbar. This quick video shows how to create a copy of the graphical representation of an object. Editing the attributes e.g. the name of this copy changes the names of all graphical representations of this object. This quick video shows how to place a object symbol using the Symbol bar. This quick video shows how to model a BPMN diagram table based using the keyboard. This quick video shows how to model an EPC table based using the keyboard. This quick video shows how to place attributes. This quick video shows how to place attributes via drag and drop. This quick video shows how to place an attribute in text field. This quick video shows how to model additional lanes in a pool. This quick video shows how to add lanes to a pool. This quick video shows how to convert expanded subprocesses to collapsed subprocesses. This quick video shows how to edit collapsed BPMN subprocesses. This quick video shows how to convert collapsed subprocesses to expanded subprocesses. This quick video shows how to export BPMN diagrams. This quick video shows how to import BPMN files. This quick video shows how to start semantic checks. This quick video shows how to change BPMN symbols. This quick video shows how to validate BPMN diagrams for export. This quick video shows how to create definition copies. This quick video shows how to create matrices. This quick video shows how to create occurrence copies. This quick video shows how to create dialogs. This quick video shows how to place elements in dialogs. This quick video shows how to apply equal spacing. This quick video shows how to configure optimization for an experiment. This quick video shows how to start a simulation experiment. This quick video shows how to configure factor variation in a simulation experiment. This quick video shows how to align the height and width of model items. This quick video shows how to create model content quickly using the mini toolbar. This quick video shows how to create model content quickly using the connection mode. This quick video shows how optional hyphen can be used for text attributes. This quick video shows how to generate a model based on matrix model. This quick video shows how to create matrix model from a search result. This quick video shows how to to create a matrix from already existing objects. This quick video shows how to create a matrix model from new objects. This quick video shows how to use abbreviations for connection types in a matrix. This quick video shows how to label the column or row header. This quick video shows how to create a an object occurrence using the &apos;Symbols&apos; bar. This quick video shows how you can create your own report script templates. This quick video shows how you can delete existing styles. This quick video shows how you can adapt existing styles to suit your requirements. This quick video shows how you can format the layout of inserted tables in the report script. This quick video shows how you can format the layout of the table cells in a report script. This quick video shows how you can insert charts in report scripts. This quick video shows how you can insert cross references in report scripts. This quick video shows how you can insert data fields into individual sections of a report script. This quick video shows how you can insert data tables into individual sections of a report. This quick video shows how you can insert formatting tables in report scripts. This quick video shows how you can insert hyperlinks in report scripts. This quick video shows how you can insert images in the formats jpg, gif, png, and emf in report scripts. This quick video shows how you can insert queries into individual sections of a report script. This quick video shows how you can add structure to reports by inserting sections. This quick video shows how you can add structure to reports by inserting subsections. This quick video shows how you can insert text fields into sections and tables in report scripts. This quick video shows how you can use a predefined report script template to create a new report script. This quick video shows how you can format the table header using data fields. This quick video shows how you can insert a images. This quick video shows how you can insert a group path of an used group. This quick video shows how you can add a process name by inserting a data field. A table of contents is to be inserted automatically. You can insert a corresponding text field in the report script. This quick video shows how you can run your report script in design view and output the report in your preferred format. This quick video shows how you can insert a cover page in the report script. This quick video shows how you can insert text fields in header and footer. This quick video shows how to represent export statistics as column charts, line charts, or pie charts. This quick video shows how to display an object from cumulated statistics in the model. This quick video shows how to configure simulation options as default. This quick video shows how to configure simulation options for single-session. This quick video shows how to create a subscription, in order to automatically create objects with specific attributes and default values, e.g. an issue. This quick video shows how the components of the link are structured. This quick video shows how to generate a dashboard link. This quick video shows how to download objects for offline processing. This quick video shows how to upload objects after offline processing using the manual confirmation mode. This quick video shows how to cancel offline processing of objects to unlock them. This quick video shows how to upload multiple objects in one step after offline processing. How to process, delegate or transfer the tasks provided by Process Governance in the ARIS task list to others. This video tutorial shows how to retrieve information on processes from ARIS Connect process administration. How to model data flows in ARIS so that the required data is available to you during the execution of an automated process.